^ Južnič, Stanislav. 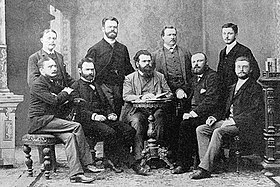 Ludwig Boltzmann in prva študentka fizike in matematike slovenskega rodu [Ludwig Boltzmann and the First Student of Physics and Mathematics of Slovene Descent]. Kvarkadabra.net. December 2001, (12) [17 February 2012] （斯洛文尼亚语）. ^ "Paul Ehrenfest (1880–1933) along with Nernst[,] Arrhenius, and Meitner must be considered among Boltzmann’s most outstanding students. "— Jäger, Gustav; Nabl, Josef; Meyer, Stephan. Three Assistants on Boltzmann. Synthese. April 1999, 119 (1–2): 69–84. doi:10.1023/A:1005239104047. ^ "Walther Hermann Nernst visited lectures by Ludwig Boltzmann" 互联网档案馆的存檔，存档日期2008-06-12. ^ Max Planck. Gegen die neure Energetik. Annalen der Physik. 1896, 57: 72–78. ^ Ruth Lewin Sime. Lise Meitner, A Life in Physics. Washington Post. May 13, 1997 [2009-02-06]. ^ Boltzmann, Ludwig. Conclusions. (编) Blackmore, John T. Ludwig Boltzmann: His Later Life and Philosophy, 1900-1906 2. Springer. 1995: 206–207. ISBN 978-0-7923-3464-4. ^ Upon Boltzmann's death, Friedrich ("Fritz") Hasenöhrl became his successor in the professorial chair of physics at Vienna. ^ 熵的另外一个定义是由克劳德·艾尔伍德·香农于1948年引入。 这一定义虽然是针对信息论提出，但可以在所有科学领域应用。当概率均匀分布时，这个定义可以还原为玻尔兹曼的定义，但只有在不同时才有实际应用意义。Its virtue is that it yields immediate results without resorting to factorials or Stirling's approximation. Similar formulas are found, however, as far back as the work of Boltzmann, and explicitly in Gibbs (see reference). ^ Maxwell, J. (1871). Theory of heat. London: Longmans, Green & Co.
Brush, Stephen G. Boltzmann. (编) Charles Coulston Gillispie (ed.). Dictionary of Scientific Biography. New York: Scribner. 1970. ISBN 0-684-16962-2. Brush, Stephen G. The Kind of Motion We Call Heat: A History of the Kinetic Theory of Gases. Amsterdam: North-Holland. 1986. ISBN 0-7204-0370-7. Everdell, William R. The Problem of Continuity and the Origins of Modernism: 1870–1913. History of European Ideas. 1988, 9 (5): 531–552. doi:10.1016/0191-6599(88)90001-0. Everdell, William R. The First Moderns. Chicago: University of Chicago Press. 1997. Klein, Martin J. The Development of Boltzmann’s Statistical Ideas. (编) E.G.D. Cohen and W. Thirring (eds). The Boltzmann Equation: Theory and Applications. Acta physica Austriaca Suppl. 10. Wien: Springer. 1973: 53–106. ISBN 0-387-81137-0. Gibbs, Josiah Willard. Elementary Principles in Statistical Mechanics, developed with especial reference to the rational foundation of thermodynamics. New York: Charles Scribner's Sons. 1902. Lindley, David. Boltzmann's Atom: The Great Debate That Launched A Revolution In Physics. New York: Free Press. 2001. ISBN 0-684-85186-5. Lotka, A. J. Contribution to the Energetics of Evolution. Proc. Natl. Acad. Sci. U.S.A. 1922, 8 (6): 147–51. Bibcode:1922PNAS....8..147L. PMC 1085052. PMID 16576642. doi:10.1073/pnas.8.6.147. Bronowski, Jacob. World Within World. The Ascent Of Man. Little Brown & Co. 1974. ISBN 978-0-316-10930-7. Meyer, Stefan. Festschrift Ludwig Boltzmann gewidmet zum sechzigsten Geburtstage 20. Februar 1904. J. A. Barth. 1904 （德语）. Uffink, Jos. 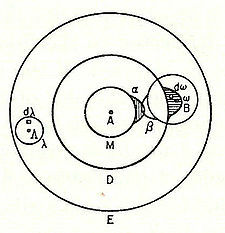 Boltzmann's Work in Statistical Physics. Stanford Encyclopedia of Philosophy. 2004 [2007-06-11].